Other information: Good with dogs and other cats. You can meet Erika at the Excalipurr Cat Cafe located at 2156 Albert St.
Erika and her two sisters were just tiny kittens when they were discovered living in an old discarded sofa by the RCR community cat team earlier this fall. They were quickly scooped up and placed into foster care. They soon became social, affectionate kittens who are ready for forever homes of their own. 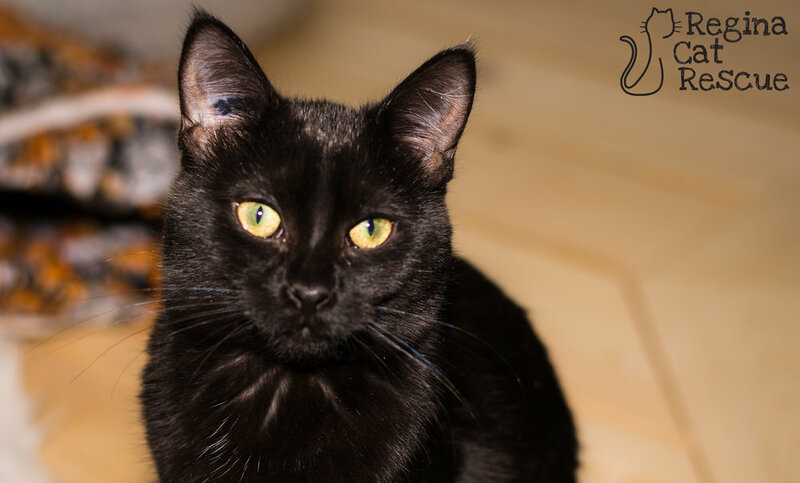 Erika is a sleek and shiny panther-like kitten who is the shiest of the three sisters, but she is also very loving and warms up quickly. This little sweetheart will warm your heart with her cuddles and purrs, and would do well in a family with other pets as she loves to play and wrestle with her sibling. Like all kittens, she enjoys toys and soft food and will keep her adopters entertained with her antics! Erika is also good with dogs. If you are interested in Erika, click here to view our adoption contract and click here to complete an adoption application or email the RCR Adoption Coordinator at rcradoptions@gmail.com for more info.